Frank Sinatra partied there. Marilyn Monroe slept there. Jim Morrison jumped into the pool there—from his second-floor balcony. Now the Movie Colony Hotel, which closed for renovations in 2015, is ready to write the latest chapter in its colorful history. 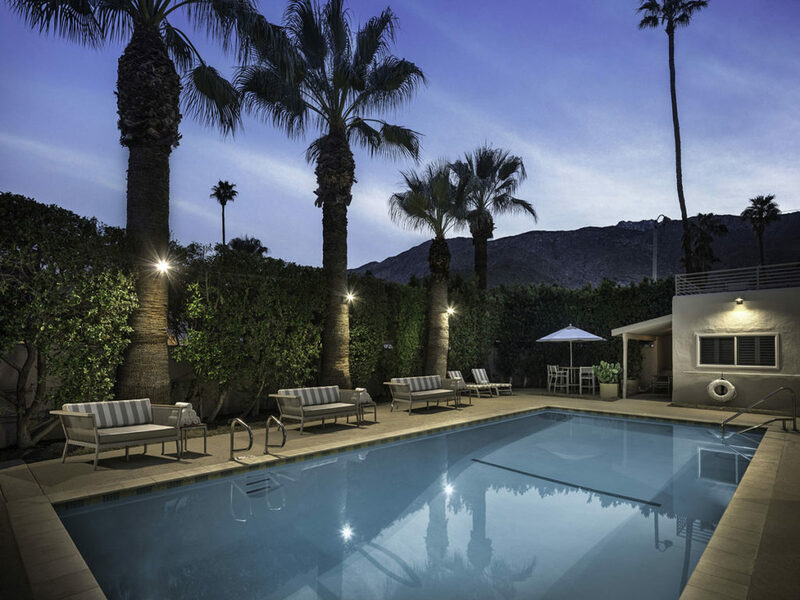 The 16-room property sits at the edge of Palm Springs’ “Movie Colony” neighborhood, where Golden Age film stars like Cary Grant, Jack Benny, Tony Curtis and Janet Leigh once owned vacation homes. The neighborhood’s many high walls, thick hedges and a lack of sidewalks are reminders of how the stars valued their privacy. The property was the first hotel designed by master architect Albert Frey in 1935. To that end, Frey’s design has been reimagined and enhanced to improve the guest experience. The architect’s original two-story townhouses have been recast into duplex suites. Warm woods, splashes of color and plush sofas and chairs have been added throughout the public and guest areas. The pool area, with a view of the San Jacinto mountains, has been enlivened by bright textile accents in yellow and white. Montage Laguna Beach has unveiled an extensive, property-wide renovation, marking a milestone in Montage Hotels & Resorts’ deep-rooted history, as this resort is the flagship property conceived by Founder, Chairman and CEO Alan J. Fuerstman. Enhancements were made to the lobby and lobby lounge, guest accommodations, and public spaces to further bring to life the sense of place, luxury, and intimacy of the resort. Montage Laguna Beach’s entry, lobby, and lobby lounge are the focal points of the resort, giving guests and locals the first glimpse into the newly designed seaside retreat. The new lobby creates a “snapshot in time,” as guests are drawn to the outside immediately, with a framed window in the lobby that overlooks the Pacific Ocean, according to the company. The lobby and lounge are warm and inviting spaces, featuring Brazilian Cherry wood floors and California coastal lobby furniture. The 253 guest accommodations, including suites and bungalows, from furnishings to the color palate, were redesigned to meld modern and traditional elements while bringing a sense of luxury to the Southern California beach style. The Ivy Palm Resort unveiled plans for a transformational two-phase renovation, updating guestrooms, lobby, outdoor pool area and restaurant into a modern, upscale hotel inspired by the resort’s heritage in downtown Palm Springs, CA. The renovation follows the change in hotel ownership, sold in May 2018 to Oxygen Hospitality. In addition to physical asset renovations, Oxygen Hospitality, which owns and operates a portfolio of branded and independent hotels, will rebrand the Ivy Palm Resort with a new hotel name, identity and amenities. Phase one of the renovation—set to begin June 2019 with an anticipated fall 2019 completion—will tackle all 100 guestrooms and suites, two outdoor pools and public spaces, redesign of the main entrance and outside bar. Phase two of the renovation, targeted for completion in 2020, will bring a new restaurant concept and additional rooms. The hotel will remain open during renovations and sectioned off to minimize disruption to guests at the property.